Create an elegant and unique Sweet 16 Birthday cake that will be sure to be remembered and a treasure to be passed down through generations. Crafted of silverplate and rose pink rhinestones this cake decoration really sparkles when surrounded by flickering candles. 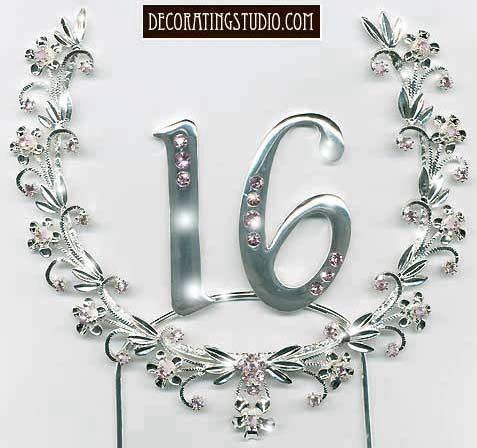 The 16th Birthday Wreath is 8 1/2" wide and 7" tall (not including the attached double cake picks to secure the wreath to the top of your cake). Please allow 1 week for your unique cake rhinestone wreath to ship. Our cake jewelry is non-returnable.